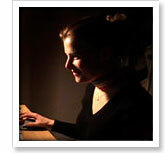 Celia Beasley is an independent filmmaker based in Seattle. After working in photojournalism and as a writer for television in Europe, Celia decided to get some hands on experience and came to 911 to take workshops. Almost four years later, she not only teaches those same classes, she has directed, shot and edited dozens of documentaries, narratives, and commercial pieces. Her work has gone to Sundance, SIFF, Telluride IndieFest and many other festivals as well as been aired on PBS, local and national cable networks, and TF1, the largest TV network in France. After a 4-month stint in Los Angeles editing the Showtime series The American Candidate, she returned to Seattle to continue making independent films.